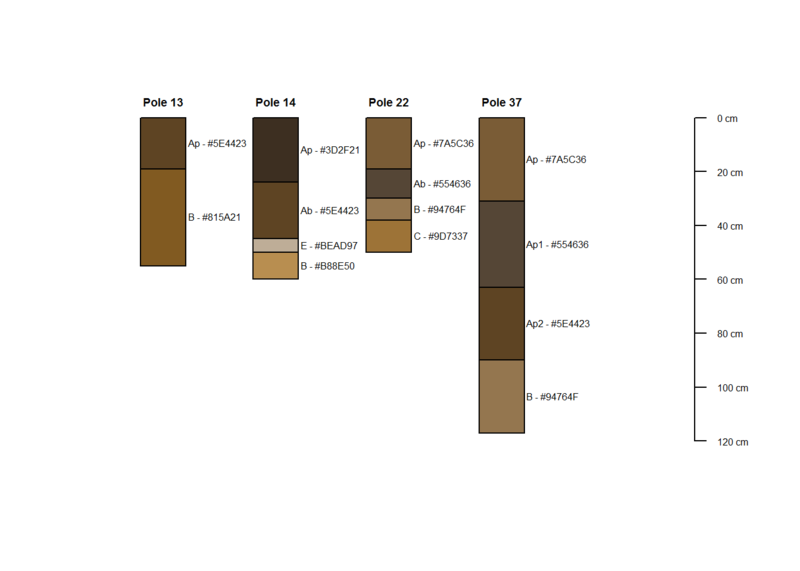 The code in the following post was first generated to find a quick way to create a large number of Shovel Test Unit (STU) soil profiles with some consistency and a few added features. This methodology uses the aqp package in R as the base function to generate the profiles and data in the form of a *.csv file. 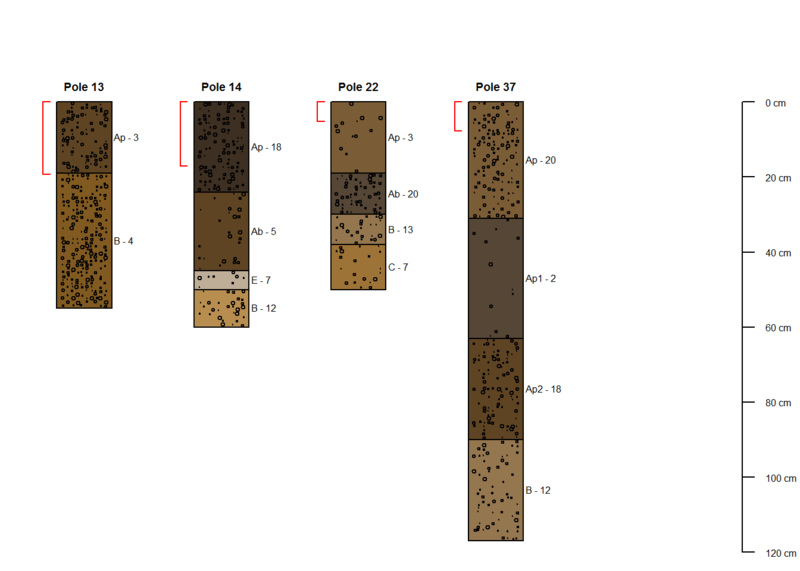 This package was originally developed to work with geology or soil science data, but we adapted it a bit for our purpose. Subsequent to developing this initial code, others in the office further developed the function to fit their work flow and profiles. The basics are here and adapting it is pretty straight forward if you dive into the guts of the amp package and read the docs. 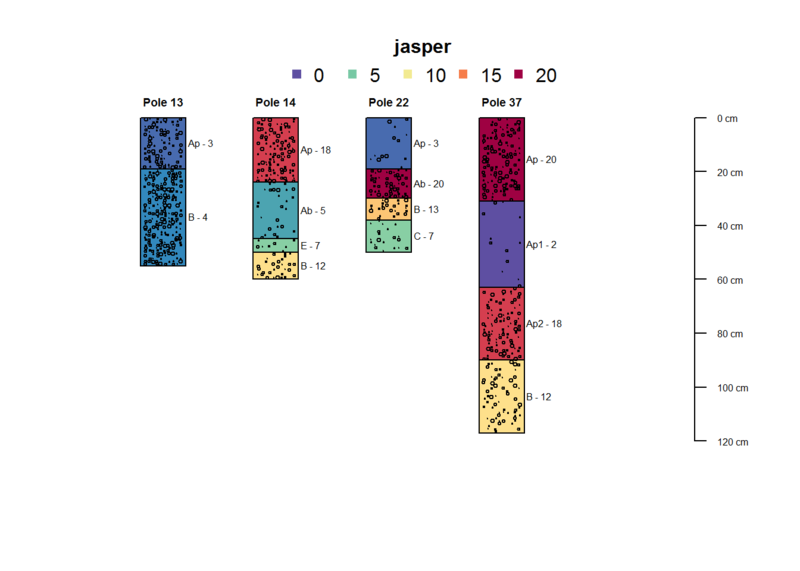 Features shown here include converting Munsell colors to hex, artifact densities, exporting as PDF and a few other tweaks. Hopefully, you will find it useful! first thing is to load the packages. The first time you do this you will need to install the packages. After that, you can just import them. Now these packages are imported. That means we can use all the functions and data the come with these packages. Google searches will return documentation on these packages and tell you want functions they contain and some examples. # I read this using the read.csv function and assign it to the variable "dat"
Now we need to put these data in the format that is used by the aqp package to do the cool stuff. This “depths” function takes the csv data and converts is into a object of class “SoilProfileCollection” for future use. By doing so, the aqp package conforms that data to a type it knows well and can use in the functions the package provides. # it uses the top to set the top of the STU and bottom for the... well the bottom. # now we see that the class of dat has been changed from data.frame to "SoilProfileCollection"
##   ..@ idcol     : chr "id"
##   ..@ depthcols : chr [1:2] "top" "bottom"
##   .. ..$ depth_units: chr "cm"
##   .. ..$ id: chr [1:4] "Pole 13" "Pole 14" "Pole 22" "Pole 37"
Whats left to do is to plot! The plot function taks the “SoilProfileCollection” object called dat and uses the “name” field in the data to assign soil horizons… simple as that! # after you run "dev.off()"
# note "stringsAsFactors = FALSE"
showing the inclusion of densities.